A friend of ours described the tiny Isle of Arran as a “miniature Scotland” which seemed an unusual description for such a tiny island off the west coast of Britain. Technically its an island off the west and east cost of Britain, sandwiched between two parts of the mainland in the Firth of Clyde. I’d often heard of Arran and having spoken to a number of Scottish people in the past weeks we’d heard only great things about the place. But would the miniature Scotland live up to its description? Our road trip has taken all over Scotland and now it was time to find out. The Hamilton family once owned the entire island and in 1800s sold off, merged and generally caused havoc for the locals, reducing the population from over 6000 to around 4000. Thanks to this island being sandwiched between the mainland of Scotland there are a couple of options. We decided we’d take the longer and more scenic route around to Kintyre, often described as looking like a key. The scenery was suitably Scottish, amazing rolling hills with a great view along the coast and Arran often present on the horizon. The ferry port is a tiny concrete ramp that’s down a single track road. We were first in line of only 3 cars and 2 men on bicycles. Such a cute little ferry and fun crossing. Before we even landed on Arran we had a wonderful surprise. 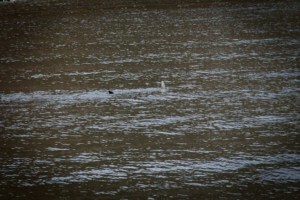 The captain of our ferry took a detour and announced that there were basking sharks on our port side. Once we’d worked out which side was Port we ventured to the top deck to get a better view. between the coastline and our ferry was a large shimmering basking shark with its fin and tail visible out of the water. We watched it for 10 minutes or so. A real treat for us newbies to the island! 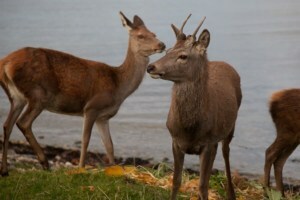 No sooner had we left the ferry and driven the port town of Lochranza, we came across 3 deer grazing by the coastline. Happy to be watched by locals and tourist alike, they seemed very at home and it was amazing to be able to get so close to them. We even recorded some video of them too! See the video below. We’ve stayed in a number of hotels, B&Bs and hostels but this time we’d be staying in a bunkhouse. Have you ever stayed in one? The idea seems to be a hostel with very little staff. You still get kitchen facilities, great common areas and bunk beds but with less staff involvement. Perfect if you want to relax, make the place your own for a few days. 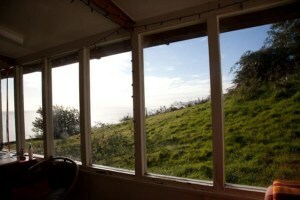 The Corrie Croft Bunkhouse is one such place. It was quite a challenge getting up the steep hill to the bunkhouse even in our full laden car. The twisting and winding road could be even more of a challenge in bad weather, thankfully the sun was shining on us. Once at the top you’re rewarded with an amazing panoramic view of the coastline and Scottish mainland on the other side of the water. 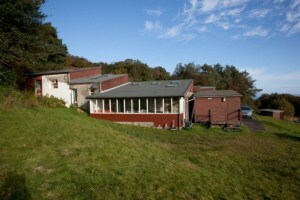 The Corrie Croft bunkhouse was comfortable if a little quirky in places. Being up a steep road you really need to plan ahead. We had just enough food to prevent us going back down the hill on our first night. The kitchen was big and had a few basics although lacked some really obvious things like kitchen towels and a tin opener. Other than that it was lovely. A great dining area, conservatory with comfy sofas, books, an amazing view to enjoy and we had a great chat with another guest about our travels and this crazy Great British Road Trip project of ours. With one full day in Arran we drove back down the hill and ventured along the coast to circumnavigate the island. 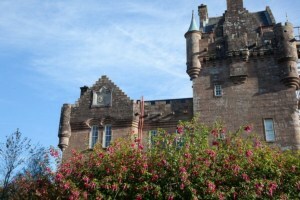 We stopped at the town of Brodick which is a port town to the mainland and also the home of a very impressive castle. The Hamilton family once owned the entire island and Brodick castle was renovated over the years from a castle fort to a summer-house in the 1800s. Its gardens are beautiful and its interior was packed with ornaments, history and even a huge collection of deer heads the family successfully shot over the past 100 years! The historians in each room gave us a great amount of detail of the family, how the castle has changed over the centuries and lots more about the many ornaments inside. Its a great place to spend a couple of hours and really soak up the grandeur of the place. The views outside of the surrounding land are great and there’s even a good quality (if a little expensive) cafe within the house. 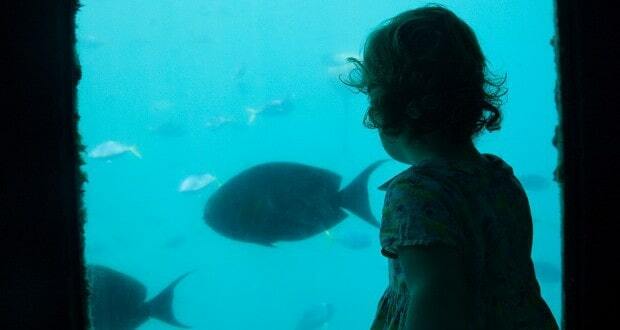 Opening times: 1 Apr to 30 Sep, daily 11.4.30; 1 Oct to 31 Oct, daily 11-3.30 (guided tours during October). We had great fun driving around the island. Its coastal road offers amazing views all the way around. We even stopped at a beach for a walk along the sandy coast. The sun was shining and it was surprisingly warm without a strong wind. The water was calm and as if waiting for an audience another Basking Shark appeared and swam around for our entertainment just off the coast in shallow waters. If walks are your thing then you’ll love Arran. 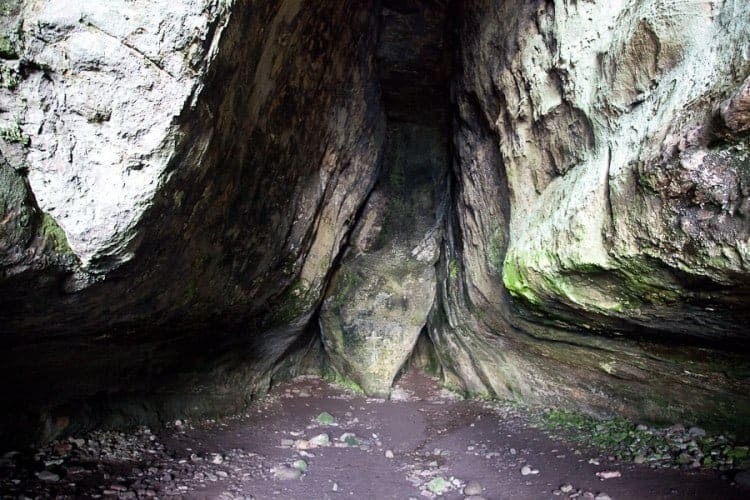 One interesting walk is down to the King’s Cave. A stretch of coastline with a 2 – 4km walk that takes you up and down along the side of a forest before heading down to the pebbly beach where there are numerous caves. The most impressive of which is more like a church! 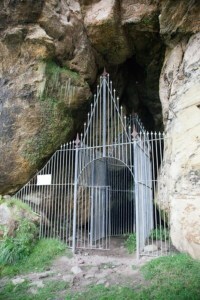 A large iron gate guards the entrance and inside the wedged rocks that create the cave meet at the end forming an alter of sorts. It is said that one of the caves was the resting place of Robert the Bruce too who had a mysterious run-in with a spider. The caves have actually be inhabited for thousands of years with a number of Pictish and christian symbols found on a number of the walls. Its an interesting place to explore with very few tourists. 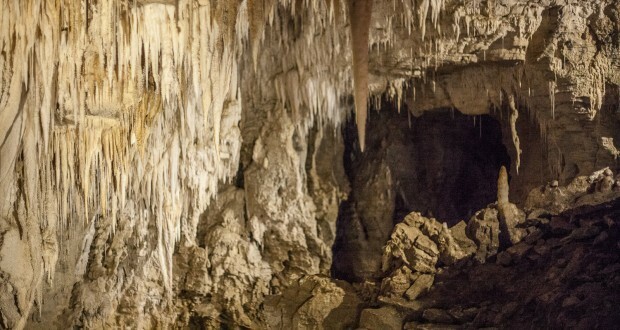 The walk can be a challenge at times but we found it rewarding once you reached the caves. 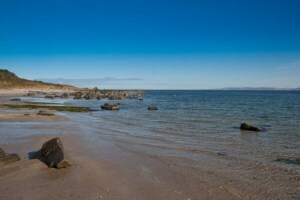 We really enjoyed our short but very sweet Isle of Arran experience. Its easy to see why people call it a miniature Scotland. It’s beautiful coastlines, rolling hills, grand mountain peaks and its fair share of castles and caves really gives you a great amount to see and do for such a small island. A big thank you to our sponsor HostelWorld and to the Corrie Croft Bunkhouse on the Isle of Arran for their hospitality. 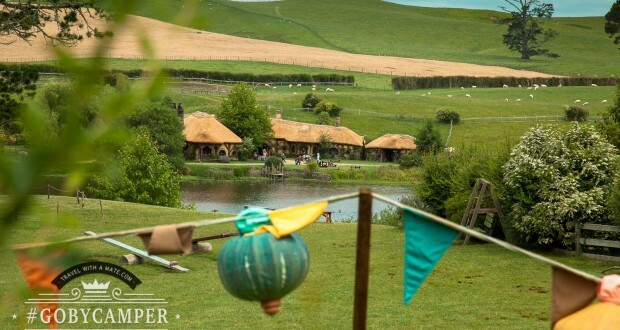 We had a great time and highly recommend a visit for a miniature slice of Scotland!